Find hotel near Boettcherstrasse And Muse .. This 100 metre long street in Bremen’s Old Town is fascinating. It’s architecture is highly curious and beautiful example of brick expressionist styles. Most of the buildings you see here are were built in the 1920s and 1930, at the initiative of a rich coffee merchant. It’s full of arts and crafts workshops, bars, restaurants, shops and a hotels. There is also carillon of Meissen porcelain bells that chime thrice a day (12pm, 3pm, and 6pm). There are also two art museums: the Ludwig Roselius Museum, and the Paula Modersohn-Becker Museum. The Paula Modersohn-Becker Museum (Museen Boettcherstrasse) was the first museum in the world dedicated to a female painter. However, it also contains may works including sculptures by the artist Bernhard Hoetgers. The Ludwig Roselius museum is a Renaissance style patriarch house that was bought by the coffee merchant Roselius in 1902. It contains lovely fine and decorative art from around Northern Europe. The two museums share the same hours and ticket prices. Find out if you qualify for a reduced price category. Prices given are for the street, not the museums. The museums share similar prices. Hours given are for the street, not the museums. The museums share similar timings. Love this? 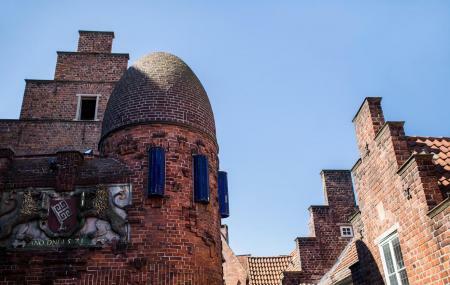 Explore the entire list of places to visit in Bremen before you plan your trip. Fancy a good night's sleep after a tiring day? Check out where to stay in Bremen and book an accommodation of your choice. How popular is Boettcherstrasse And Museen Boettcherstrasse? People normally club together St. Peter's Cathedral and Schnoor while planning their visit to Boettcherstrasse And Museen Boettcherstrasse.